I've been working with Tom since 2004 and truly believe that his unique style of teaching and exercises helped me earn my 12 medals in the Athens, Beijing and London Olympics. Tom's Pilates and Yoga program played a significant role in my success. He helped me move more efficiently in the water, avoid injuries, and improve my functional strength. The Center of Balance is a great place for people from all walks of life, for healthy individuals looking for core strength, for athletes, dancers, for people with injuries, people recovering from illness etc. Thanks to working with terrific trainers at Center of Balance, I did not become exhausted wandering at the San Jose Jazz Festival last weekend and, literally, felt no pain. After two babies, I suffered chronic hip pain that disappeared after strengthening my core and increasing flexibility through Tom's workout. The Center of Balance and its teachers helped change my life. Not only am I 20 lbs lighter with better tone and strength in my muscles, but I have learned more about the human body and how it works than I ever did in any science class. I've gained a greater understanding of Pilates including the core, breathing, and engaging of muscles. I leave class feeling stretched and as if I've worked, but also energized and aligned. I love it! Center of Balance is excited to be one of the first studios to enhance our movement program with the CoreAlign System. 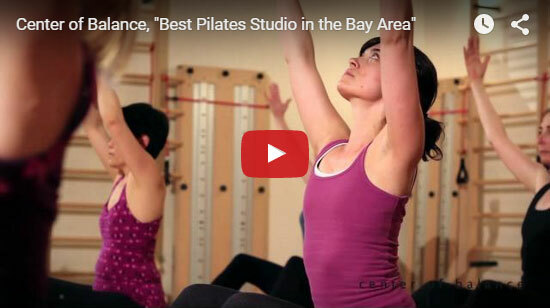 Center of Balance has been a leading teacher training center since 2001, with Pilates mat & equipment and CoreAlign courses directed by Tom McCook. 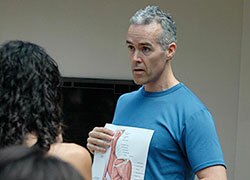 Learn Pilates and movement under our expert guidance, and address your personal needs and goals. Try our Welcome Package!